Acromioclavicular joint is a type of synovial joint which is present in between the Acromian process of scapula and lateral end of clavicle. Around 2.5 cm medial to the point of the shoulder lies the acromioclavicular joint. These are small facets found on the lateral end of clavicle and the medial margin of the acromion process of the scapula. The articular surfaces are covered with fibrocartilage. The joint cavity is separated by an incomplete wedge- shaped articular disc. The joint capsule comprises of a loose fibrous layer. The synovial membrane lines the internal surface of the fibrous joint capsule, extending to the edges of the articular disc. Generally, the three ligaments that provide strength to the acromioclavicular ligament can be divided into intrinsic and extrinsic Ligaments. Acromioclavicular ligament: It is a fibrous band that prolongs from acromion to the clavicle. It strengthens the acromioclavicular joint superiorly. Coracoclavicular ligament: It lies a little away from the joint itself but play an essential role in sustaining the integrity of the joint. 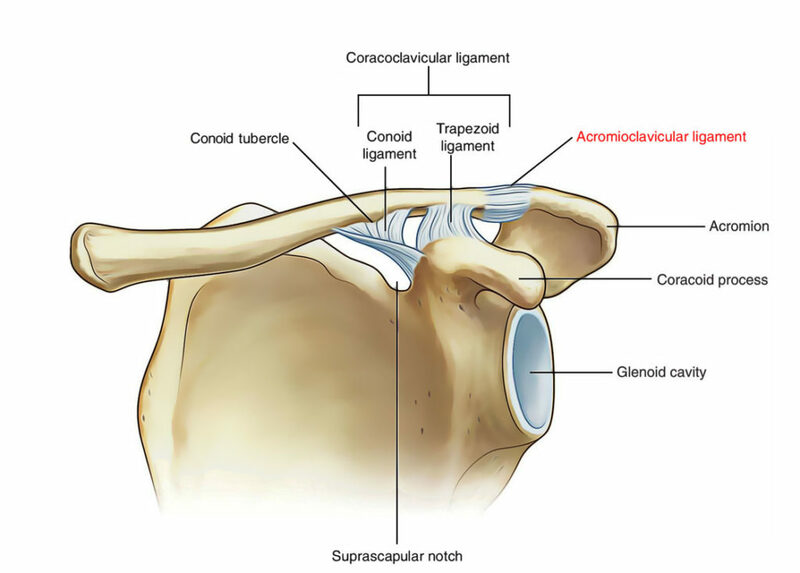 The coracoclavicular ligament comprises of two parts: (a) conoid and (b) trapezoid, which are united posteriorly and frequently separated by a bursa. Conoid ligament is an upside down cone-shaped fibrous band. The apex is attached to the root of the coracoid procedure just lateral to the scapular notch and base is attached to the conoid tubercle on the inferior surface of the clavicle. Trapezoid ligament is a horizontal fibrous band that extends from upper surface of the coracoid process to the trapezoid line on the inferior surface of lateral end of the clavicle. The coracoclavicular ligament is largely responsible for suspending the weight of the scapula and upper limb from clavicle. The coracoclavicular ligament is the strongest ligament of the upper limb. The acromioclavicular joint permits the turning of acromion of scapula at the acromial end of the clavicle. These motions of acromioclavicular joint are associated with motions of scapula at the scapulothoracic joint/linkage. Suprascapular artery which arises from the subclavian artery. Thoraco-acromial artery which arises from the axillary artery. Branches of suprascapular and lateral pectoral nerves innervates the acromioclavicular joint. The size of disc of the AC Joint differs between individuals depending on the age and between sides of the same individual. In the initial 2 years, the joint is actually a fibrocartilaginous union. With the utilisation of the upper extremity, a joint space develops at every articulating surface that may leave a meniscoid fibrocartilage as a remainder within the joint. Dislocation of the acromioclavicular joint: It may take place following a severe blow on the superolateral part of the shoulder. In severe form, both acromioclavicular and coracoclavicular ligaments are torn. Consequently the shoulder separates from the clavicle and falls due to the weight of the limb. The acromioclavicular joint dislocation is frequently termed shoulder separation.